Ice Cream Recipes, Articles, Gifts, And Fun To Satisfy Your Family's Obsession. Does this sound at all like your family? Well, it describes our family's ice cream obsession pretty well. Even our daughter who is allergic to milk is crazy about it! (She eats the soy kind.) We're all ice cream freaks. We Love It, We Eat It, We Make it, We Buy It. In our family, consumption of this creamy dessert is a daily ritual. It's the first thing my kids ask for when they get home from school and it's the first thing they ask for after dinner. I have to sometimes say no or they would eat it after every meal! there is a way to put them in your homemade recipes. But...You must have a very powerful piece of equipment. (I'll tell you more about this "secret weapon" later). You just might be an ice cream freak too. Explore the science of making it. Get useful tips and entertainment from articles. Try out our homemade recipes (including non dairy recipes). Find coupons for your favorite brands. Use our fun ideas in your next family activity (We'll also share some of our favorite experiences with this frozen delight). Shop for an ice cream maker, a book, or any number of novelty gifts you're sure to enjoy. Whatever you decide to do, we hope you feel like family. You're always welcome here and we'd love to hear what you have to share. Get ready to fill your favorite ice cream bowl...'cause here's the scoop. Build A Website With No Prior Experience. If I can build a website, so can you. Learn how and why I built my ice cream website. The Ice Cream Blog will give you the scoop on changes and updates made to the ice-cream-freaks.com website. Subscribe here. A Brief Advertising Policy for ice-cream-freaks.com. Get a Brain Freeze Newsletter subscription for free! 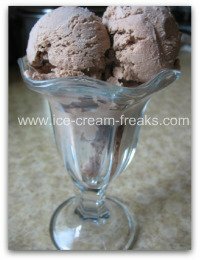 Sign up and have the latest ice cream recipes, reviews, fun, and more on ice-cream-freaks e-mailed to you. Creating your own homemade ice cream recipes is simple and fun for the whole family. Here's how to do it. Soy ice cream recipes made right at home. Tasty, less expensive than store bought, and best of all...you control the ingredients. Learn to make healthy ice cream recipes at home in 30 seconds with what I call a "secret weapon" blender. Tasty, fast, and best of all...you control the ingredients. Making delicious gourmet sorbet recipes at home is easier than you think. Why pay for it at the store when you can make healthy sorbet that tastes better too? Tickle your tastebuds with these non-traditional ice cream sundaes. The recipes are simple but the end results are out of this world! You can read ice cream reviews by ice cream freaks who have tasted and typed about flavors of popular ice cream brands. Read these book reviews to discover some great ice cream themed books worth adding to your library. Print these free coloring pages for your kids to color. They all have an ice cream theme and would be a great activity for an ice cream party. You'll have a blast with these ice cream party games and activities. There's something here for the whole family to enjoy. Help each student in your class become an inventor of ice cream with these fun writing projects. They offer creative ways to get to know each other better. Bring some fresh snow inside, add a few ingredients, and tadah...you've got snow ice cream. Make it today and create a memory your kids will always cherish. Inexpensive ice cream gifts to make for the ice cream lovers in your family. Learn some fun facts on ice cream and impress your friends and family. Even the "know it all's" will think you are so smart (or annoying, in my case). Ever wish there was an ice cream diet? Here's a funny poem to entertain those thoughts a little. Enjoy some great movie scenes that spotlight your favorite desserts...ice cream. Try my ice cream treat suggestions with each movie. Simple yet satisfying to eat any time of the year - Nutella Ice Cream . Just can't get enough! 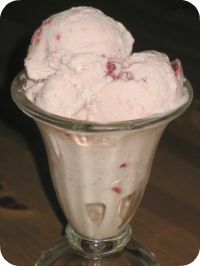 Strawberry Ice Cream is what the mouth waters for when we see those fields of fresh ripened-by-the-sun strawberries. This recipe doesn't disappoint. Starting to feel like I need a vacation!!! School is ending soon. Yay! How about celebrating with this vacation-in-a-cup. 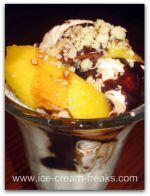 This Tropical Ice Cream Sundae will get your Summer started with just the right level of ... Ahhh! It's the best blender in the world for making 30 second ice creams, sorbets, and smoothies. Find out what else it can do. This is how I'm building my website so I can stay home with my kids and "recession proof" our life. Read my story.